Cast on 39 stitches using WW cotton yarn & US7 (4.5mm) needles. Repeat rows 1 through 8 four more times (for a total of 5 repeats). Use whatever border you like. 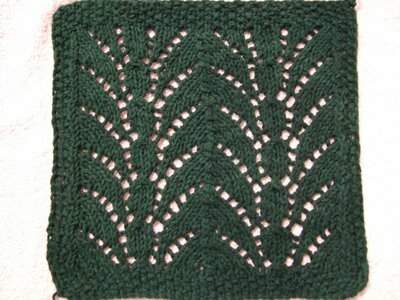 I used seed stitch in the one pictured above. For the top/bottom rows I did K1, P1 across to the end, ending with a K1. For the 3 stitch side borders, K1, P1, K1. Love the Fountain lace Cloth. All of your dishcloth are so cute. Thank you for sharing them.